How many fruits and vegetables have you had today? How about the kids? If you’re like most Americans, the CDC says it’s not enough. Sure, it can feel like a challenge to get more fresh plant-based foods on to your plate, but it’s absolutely worth trying. Nothing good ever came from a beige plate of food. That’s why every plate should look like a rainbow. We’ve got a pretty healthy, simple, and delicious way to fix this fruit and veggie problem, at least a part of it. 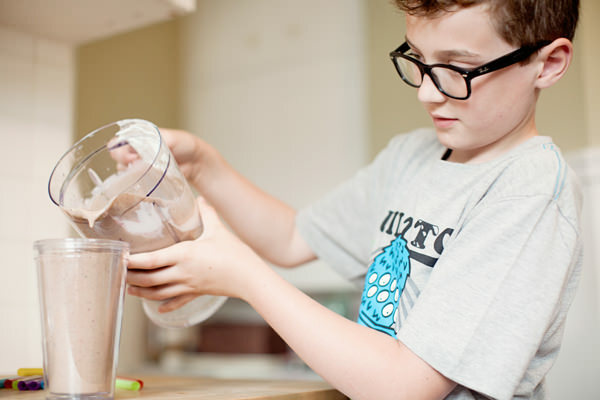 You and the kids are going to love our Rainbow Smoothie because it’s as tasty as it is fun. 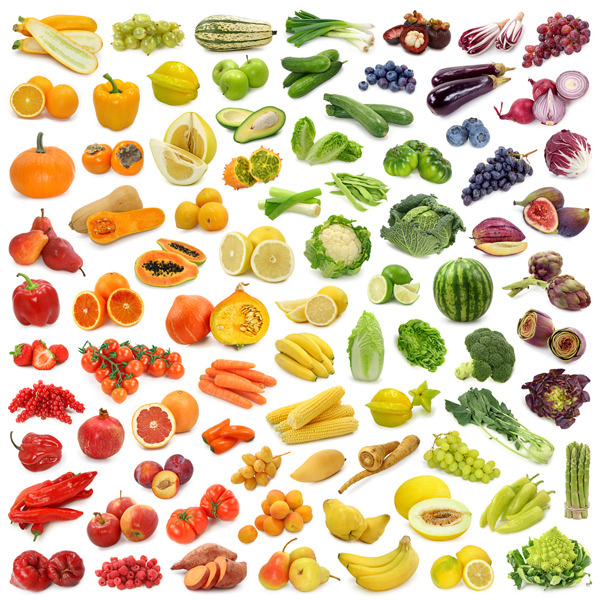 The premise is really pretty simple – select one fruit or vegetable from each color family. Combine these with yogurt in a blender, and voila, you’ve got as much as seven servings of fruits and vegetables in one cup. If your kids haven’t met Roy G. Biv, now is a great time, especially when they can relate it to food. ROYGBIV represents the colors of the rainbow: red, orange, yellow, green, blue, indigo, violet. Now, that last arc of the rainbow gets a little tricky, but plenty of options exist. You can reference this chart. Stick it to the refrigerator and let the kids familiarize themselves with each food item, or they could even use it as a Rainbow Smoothie menu. 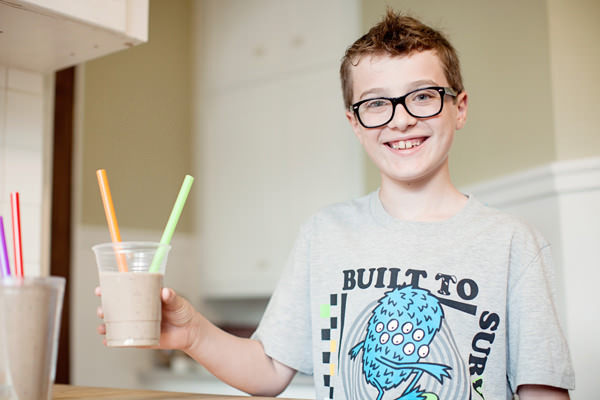 These smoothies are so easy your kids can make one themselves as a quick on-the-go breakfast before school or even as an after-school snack. To prove it, we had Judah make this one. All by himself. And no smoke, this nine-year-old gulped his down and asked for more! Now, for our version of the Rainbow Smoothie, we used raspberries and strawberries for red, mango for orange, pineapple for yellow, spinach for green, blueberries for blue, and blackberries for the indigo/violet spectrum. Blended down with Greek yogurt (consider that the fluffy, white clouds), a pale pink color emerged. It was sweet and satisfying, with no sign in the flavor of the spinach. It’s what we call an “invisible vegetable,” you can’t taste it but the nutrition is definitely there. 1. Combine all ingredients in the blender. Add ice and blend until smooth. Serve immediately. 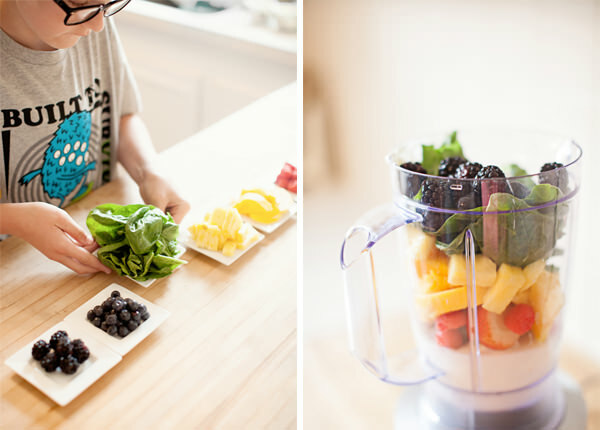 There really is no wrong way to make your own Rainbow Smoothie, and you should play with the ingredients to find the go-to combination for your taste or mix it up every time. 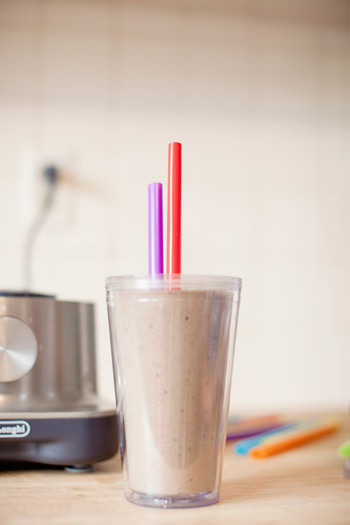 Doesn’t a smoothie made with strawberries, pumpkin puree, bananas, avocado, figs, and blueberries sound delish? You won’t know until you try! Blast your system with raw, fresh nutrition from a generous serving of your daily fruit and vegetable needs. The Dietary Guidelines for Americans calls for 5 to 13 servings per day. 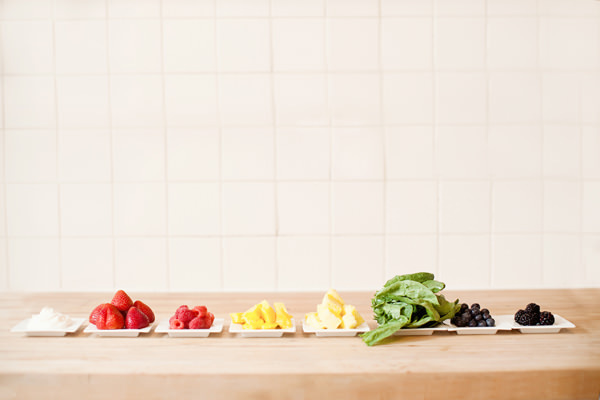 With the Rainbow Smoothie, you’re already half way there. Add tomato on a sandwich at lunch with avocado instead of mayo, and serve a sweet potato with a salad at dinner and you’ll effortlessly get all of the plants your body needs! Recipe by Brandi Koskie. Photo by Kacy Meinecke. Special thanks to Judah Hansen.